Hi, I am interested in your 1985 Chevrolet Camaro (stock #4772-CHA) listed on Autotrader for $12,995. I'd like to get more information about this vehicle and confirm its availability. 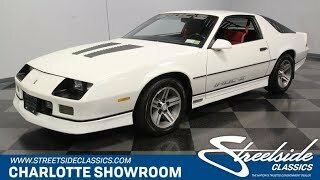 A 1985 Chevrolet Camaro IROC Z/28 like this is about finally fulfilling a promise. After all, when you first saw one of these coupes, its mix of muscular and sleek lines made you vow right there that someday you would own one. Now this loaded and highly original example can make your dream come true for quite an affordable price. The IROC-Zs are truly stunning machines, and this one is near the top of that class. Not only is 1985 the IROCs first year, but also the factory-correct white paint appears to be original. But desirability goes far beyond preservation. Chevy knew how to dress its most aggressive Camaro correctly with a terrific black and white total package. The full body kit (including rear spoiler), hood louvers, rear window louvers, and 16-inch IROC-Z alloys are all part of a planned attack as the top V8 Camaro was out to re-take the streets back from the 5.0 Mustangs. While this car has averaged less than 2,150 miles annually, the interior looks exceptionally fresh, even for a low mileage car. Thats because they took the right care of everything, including utilizing seat covers. Thats particularly nice, because the red looks bold against the white exterior. Beyond just the right color, this Camaros interior is a great place to spend some time. Youll slip into the high-back bucket seat that has the right bolstering to be all-day comfortable. The factory three-spoke wheel has been specifically developed for comfortable hand positioning while still getting a clear view at the full gauge package. Like any good IROC-Z, this one came loaded with a power windows, power locks, tilt steering, electric rear window defogger, and cruise control. But there are some great upgrades for modern driving, too. For example, the radio is now a more modern AM/FM/CD stereo. And the air conditioning is now blowing cold with modern R134a. These third-generation Camaros are especially desirable for whats under the hood. After all, we all love a classic that also includes a fuel-injected V8. The 305 cubic-inch power plant is original to the car, which makes this a great collector. But a coupe like this is also great for driving. This V8 is known for being smooth on the highway and quick off the stoplight. And this IROC proves its a great all-around around classic even more with features like the four-speed automatic transmission w/overdrive, power steering, sway bars front & rear, and four-wheel disc brakes. A superb and factory-correct presentation is everything you wanted in an IROC Z/28 back then, and your desire has only grown over the years. So dont let this affordable opportunity pass you by. Call now!